--EPOTactical.com-- Always outsmarted, never outgunned! : What? What in the World is the EPO? Ok, so long story short, EPO stands for Extended Power Outage. It was the term Clint began using to describe his NOT prepper behavior of stockpiling a little food, water, and medical supplies in the event of a natural disaster which would potentially cause- yup, you guessed it, an Extended Power Outage. Hey, it sounds much less crazy than stockpiling stuff for Zombie Apocalypse, right? Clint mentioned to Dwain that he'd been grabbing supplies and shared some info he'd gathered with Dwain, and Dwain gathered up some supplies too. Dwain had become tight with Jeff after Clint had quit the auto factory where all three of them worked together, and Jeff began getting in on the act too. Then a few years later, Clint returned to working at the auto plant, and the three started hanging out a lot again, especially in Clint's office/ closet quarters, and whenever the three would get together to talk about guns, what video games they were going to play that night or try and agree upon a day they could all visit the shooting range together, they began jokingly referring to these meetings as EPO meetings. 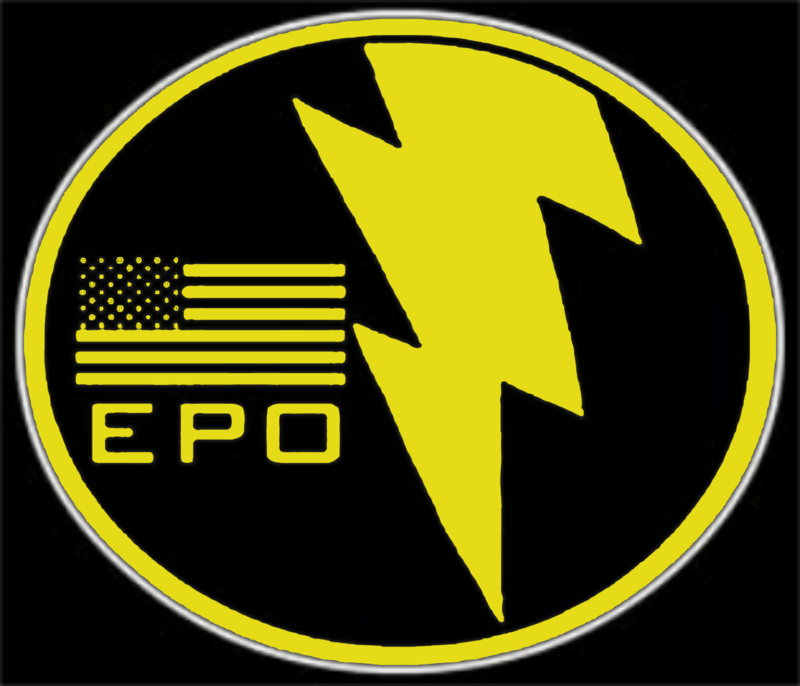 At some point, Clint made a rough image of an EPO logo that Dwain then took and made cooler which became his phone's wallpaper. Jeffro then did the same. The boys talked about stockpiling a horde of ammo out at Jeff's place in the country which they began referring to as the EPO HQ and Jeff Brush in roughly equal parts. In any case, at some point Jeff mentioned in the office one day that his wife had asked him to burn an old couch that he'd dragged out to their trash pile and Clint had the brilliant idea of setting it on fire with Dragon's Breath shotgun rounds. This then subsequently lead to the story/ script/ video idea that would become "Couch." Clint, Dwain, and Jeff went to lunch and Clint talked about this rough idea for the video. Dwain and Jeff contributed more jokes and funny stuff, and suddenly everyone was all fired up about making the Couch episode. Pun intended. The next day on the way to work, Clint had the idea for "New Targets." Upon telling the boys the idea, they contributed lots of funny stuff again and the three decided to try and actually do something with these ideas, which of course lead to more ideas for videos, this website, the current EPO logo, and everything else you see before you.